Even in a drought, these grasses will help your yard keep holding on! One of the most frustrating sights for a gardener is the patchy, brown, and yellow eyesore that is a yard in the middle of drought. In areas prone to long stretches without rain, the yards often show signs of it first. When this happens, you have a key choice. You can irrigate the yard, which is time-consuming, costly, and considered wasteful by some. The other option is to just weather the eyesore of a dying, crunchy yard, but this is hardly ideal either. One of the exciting developments in the world of grass science is the development of varieties of grasses that are drought resistant, meaning that they are able to remain lush far longer than a typical grass would under low-water conditions. This means that with less irrigation or rain, you can keep the gorgeous yard you want. Consider the following possibilities for a more low maintenance lawn that will save you time, conserve water, and potentially even save you money in the long term. 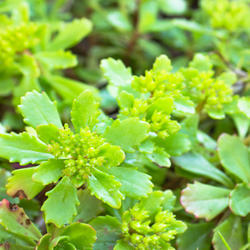 Our first contender isn't a grass at all, but instead a low-growing, evergreen plant that forms a fern-like, bright green mat across your yard. It's typically considered a weed, and when it simply emerged between blades of grass, it makes sense to call it one, because it is hearty and grows in even tough conditions. However, when you replace your entire yard with yarrow, it becomes a wonderful, drought-resistant alternative that also tends to muscle out most other weeds. If you have children or dogs that spend a lot of time outside, it is pretty good at standing up to foot traffic, so this might be the best option if you want to fight drought and still have your tough green lawn to show after an afternoon of running around in the backyard. Most buffalo grasses, originating with Midwestern prairies, are fairly drought resistant, but UC Verde was developed specifically by the University of California as a way to have the lush green yard you desire with much less water than is necessary for many other varieties. It does best in quite warm areas, so it may not be the perfect choice for your coldest states, but it holds up under foot traffic and can look good even if you don't mow it all that frequently. It's nice to have a yard option that is low maintenance both in the mowing and the watering departments! If you are looking for a truly unharmable lawn, you might want to give Eco-Lawn a look. It's designed to take the needs for particular levels of sunshine, a particular mowing schedule, and even a fertilization regimen out of the equation, leaving you with a nearly no-maintenance yard that stays bright and green. 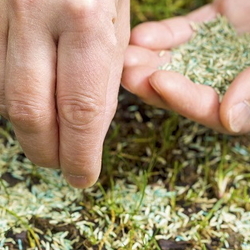 The secret is in the selection of fine fescue seeds that Eco-Lawn combines; they grow slowly, meaning that they don't require mowing quickly, but that slow growth also helps with their hardy nature. Truly the right fit for anyone who wants a consistent green color even when drought comes around and no one wants to be outside mowing. This option lets you "think outside the lawn," aiming instead for this mix of grasses, clovers, and flowering seeds that create a gentle, nearly-ornamental meadow instead of a traditional grassy lawn. The mix is drought resistant and can be treated more like a mini-meadow if not mowed heavily or can appear more traditional when mowed to 3 inches or so. People who want to draw pollinators to their gardens will often opt for a Fleur de Lawn instead of a traditional grass, recognizing the benefits of having more bees and other beneficial insects in the area. There is also something really beautiful about seeing a sea of fairly uniform flowering plants, and clover provides some natural shields against other potential weeds that keeps your flowering meadow looking surprisingly uniform. If you are in a Southern state and want a grass that holds up under medium usage but is also drought resistant, bahia has definitely become one of the go-to's. A typical grass that will still need regular mowing, it delivers the value of not having to be outside rigging up your irrigation system or sprinkler in the hot sun. This is one of the better options when you want to go with a recognizable, typical grass seed but want to make sure you are watering less without losing the look of your yard. 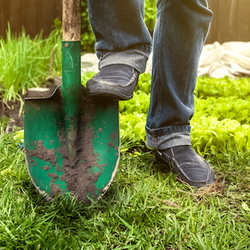 It is easy to start from seed, but make sure to continue caring for it, since it can take between a few months and two years to get your sod fully established. No matter which lower-maintenance grass or grass alternative you choose, there is an option to fit your climate, mowing preferences, and foot traffic levels. Hearty options are in demand and thus are being developed all the time; be the first in your neighborhood to try one!